Our Lady of Perpetual Tsuris: Bagels and WHAT? For some reason, this album popped into my mind today. That isn't to say that it doesn't show up there from time to time, along with assorted otherwise bygone detritus, but the sight of trays and trays of bagels set up in the social hall of our synagogue -- also my son's Hebrew school -- definitely brought it to the forefront. My father, a Slovak by birth, loved Latin music and had quite a collection of records, from Celia Cruz to Xavier Cugat. He also enjoyed traditional Jewish liturgical music, and had several recordings by Jan Peerce. Klezmer was another love -- as it is mine -- although it wasn't known to the general population to the extent that it is today. And then there were the less traditional, but still Jewish-influenced artists -- such as The Barry Sisters. So, inspired by this sudden memory upon me, I decided to google Irving Fields, and learned that his album had been re-released back in 2005 and, as these things often go, has gained a whole new audience. It turns out that his name was not originally Irving Feld, but Isadore Schwartz. I guess he liked the sound of Irving Fields better than he liked the sound of Irving Black, and I guess I have to agree -- even though anything with "Irving" hardly sounds assimilated. But assimilation wasn't his focus, and for that I am grateful, if not only for his music but for the memories his albums evoke. You can read about Irving Fields here, should you be so intrigued. 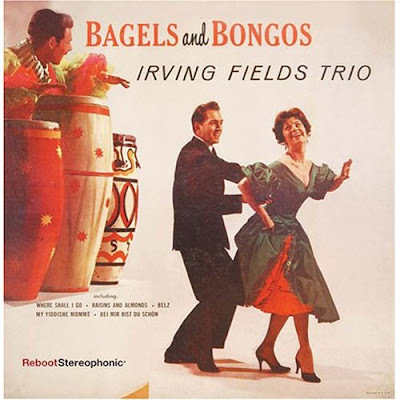 I just came across your Nov 2008 blog on Irving Field's Bagels & Bongos. I thought you would be interested in his latest efforts. His 1960 classic “More Bagels & Bongos” has finally been reissued on CD, via my Manhattan-based indie label Roman Midnight Music www.romanmidnightmusic.org . The album is available both as downloads and on CD. Further, 94-year old Irving acted as creative director on the reissue, even suggesting a new look/cover to this forgotten classic which I designed to his specifications. Also available online (as a .99 cent mp3 download) is a special home recording of Irving’s famed Youtube.com Theme Song, currently not available anywhere else. This is the first of many projects between Irving and RMM, including the 2010 reissue of “Bikini & Bongos” (Hawaiian & Latin) and the solo effort “Jewish Comedy Songs”. Further, to add in your blog...you talk about how you "surmise" that Fields was anglicized from Feld but discovered otherwise. Yes, he was indeed Isadore Swartz at one time, but, according to what he's told me, it got changed accidentally as a boy when his sister (who was a singer) called him Isadore Fields once to pose as her husband not brother to warn off men. I can't remember how Irving came about. Thank you, Aaron, for not only the good news of Irving Fields' latest efforts (at 94! ), but also for shedding light on how he came up with his professional name. I appreciate it, and will definitely be checking out your label, www.romanmidnightmusic.com! Cheryl, I was looking up the appropriate set of words to describe a troll on another such board and I came across this and gave it a quick read. HILARIOUS stuff!! On this after-Thanksgiving of 2010 otherwise known as black friday to the lesser minded among us that might actually want to fiord that river of desperate idiots that truly believe there is a special treat waiting for them that no one else will see on Saturday, my salute and salutations. I read about the other-than-normal relative, cracked up and would like to join your clan. To save you software time I will tell you I live in Houston Texas and am a woman of a certain age that enjoys all things horse and journalistic. Please write back and let me know if this came through. I feel we have much to learn from each other.And not a few good laughs to share. Hey, Aaron Joy here from Roman Midnight Music with an update! I've just released (last week) Irving's autobiography "The Pianos I have Known" with Huffington Post columnist Tony Sachs. You can see info on my website (same address as above) & drop me an e-mail if you're interested in sharing it for the blog & I'll send a pdf.